Panelists, delegates and guests at the event. 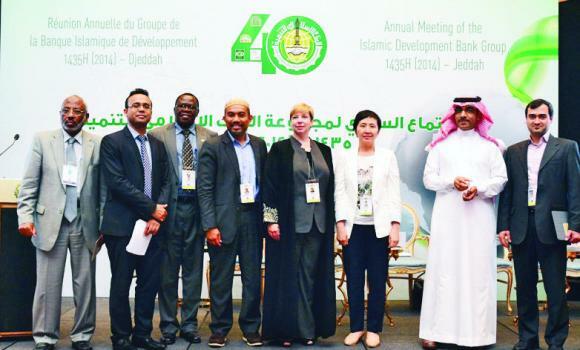 The Islamic Development Bank has announced the start of a networking platform with the objective of connecting the IDB and its member countries as well as institutions working on successful innovation projects and replicates them on a bigger scale. The announcement was made by Osman Mahgoub El-Feil, director of the Knowledge Management and Innovation Special Program at IDB, during a forum titled “Fostering Dynamic Innovation Ecosystems in Developing Economies”. The forum focused on encouraging creativity and building a dynamic innovation ecosystem across countries and communities that can nurture the development of long-term innovative ideas, products and solutions to add value to the economy. 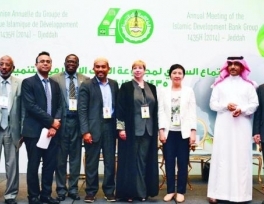 The forum, held in conjunction with the annual meeting of the Islamic Development Bank (IDB) Group, highlighted several important issues such as funding for innovation and the roles of key stakeholders such as governments, the private sector, civil society and the international development community, to ensure a successful innovation agenda by implementing key success factors for an effective innovation ecosystem, lessons from IDB member countries, approaches in setting up innovation for value creation, innovation in Korea, and lessons from the global best practices in driving ideal innovation ecosystem. The forum also stressed the need to identify pitfalls to avoid when trying to develop an affective innovative ecosystem. The panel, moderated by Maria A Douglass, a strategy manager at King Abdullah University of Science and Technology (KAUST), comprised five speakers. They are Aziph bin Dato’ Mustapha, acting CEO of Malaysian Innovation Foundation; Haeng A Seo, associate research fellow at the Korea Institute of S&T Evaluation and Planning (KISTEP); Maxwell Otip Onapa, deputy executive secretary at the Uganda National Council for Science and Technology (UNCST); Ali Morteza Birang, deputy of international affairs and technology exchange at the Vice-Presidency for Science and Technology of the Islamic Republic of Iran; and Khalid Aldakkan, associate research professor at King Abdulaziz City for Science and Technology (KACST) and director at Innovation and Industrial Development Institute. Audience members representing diverse backgrounds included government and leading industry officials, visiting professors and graduate students. The panel explored transformative innovations and the most important challenges being faced in fostering dynamic innovation ecosystems in the developing economies. The discussions covered topics such as ensuring sustainable funding, economic growth and creating employment. In summary, the forum was a highly interactive and fruitful session among the panelists and the audience members.